How do you take a picture of the moon? Well, I could start with a better camera I guess. I can’t help but try, though. Raf took this one. He had the photography bug while we were out camping. He took some really cool shots so I thought I would post one here. This is a picture of the full moon rising over South Skookum Lake in the Colville National Forest. We had a wonderful time this weekend. It was really nice to get out of Spokane. Really, really nice, actually. We camped overnight. It was really quiet. I heard an owl and I saw bats at dusk flying toward the lake to go catch bugs for dinner. When it got darker we went down to the dock and stargazed. 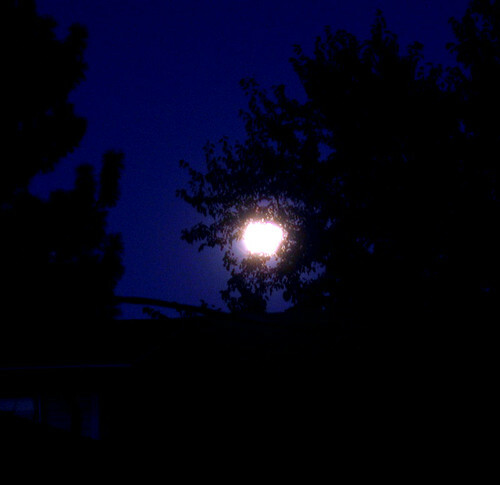 Then we watched the full moon rise. Lovely.